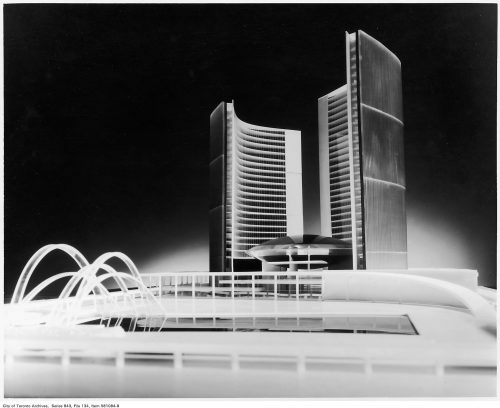 Nathan Phillips Square and Toronto’s new City Hall were only completed in 1965, however the site had been earmarked for a major civic space since the early twentieth century, after the completion in 1899 of E.J. Lennox’s City Hall (the building now known as Old City Hall). 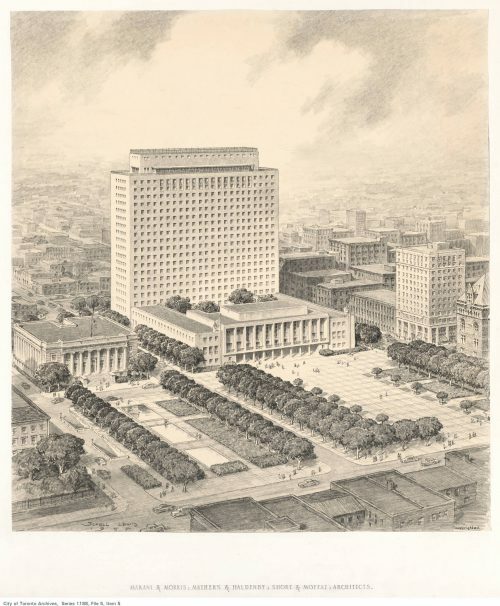 In 1911, the Civic Improvement Committee proposed razing the buildings in the blocks between Osgoode Hall and Old City Hall in order to create a “civic centre” of grand administrative buildings around a new civic square. Only one building from this scheme, Charles Cobb’s Registry Building, was ever constructed. By the 1920s a number of further proposals for public squares in this area were developed. It was also becoming clear that Old City Hall was too small to satisfy the City’s growing need for office and court space. These designs featured a variety of new public buildings, including a new city hall, a courthouse, police headquarters and war memorials, all preserving the 1917 Registry Building. 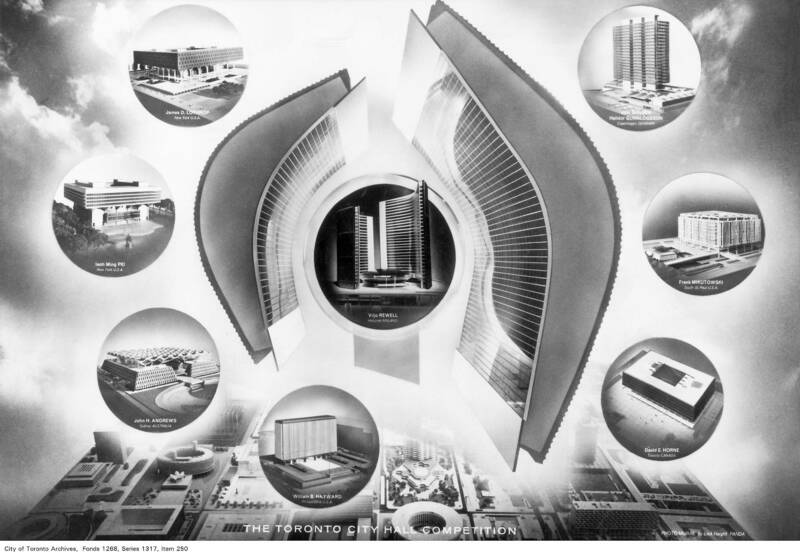 In a 1947 plebiscite Toronto voters approved the acquisition of land that would become the site of Nathan Phillips Square. The creation of the Metro Toronto level of government in 1954 made the matter even more pressing. 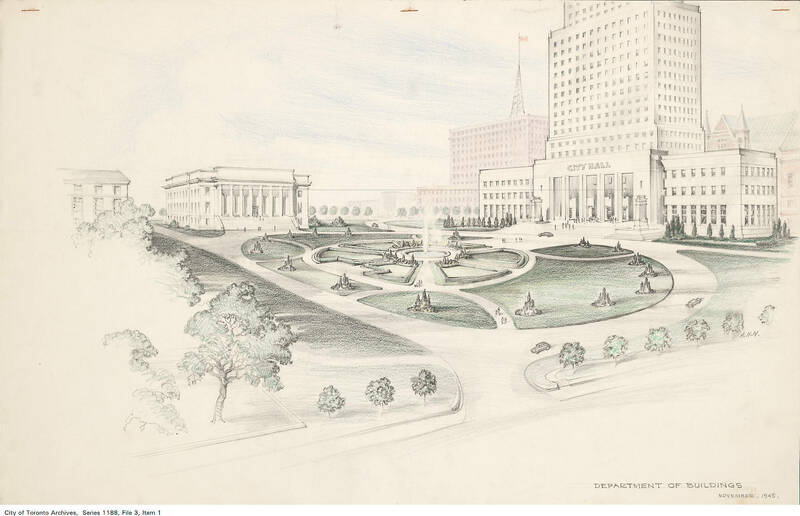 City Council asked three local architectural firms, Marani & Morris, Mathers & Haldenby, and Shore & Moffat, to collaborate on a new city hall plan. 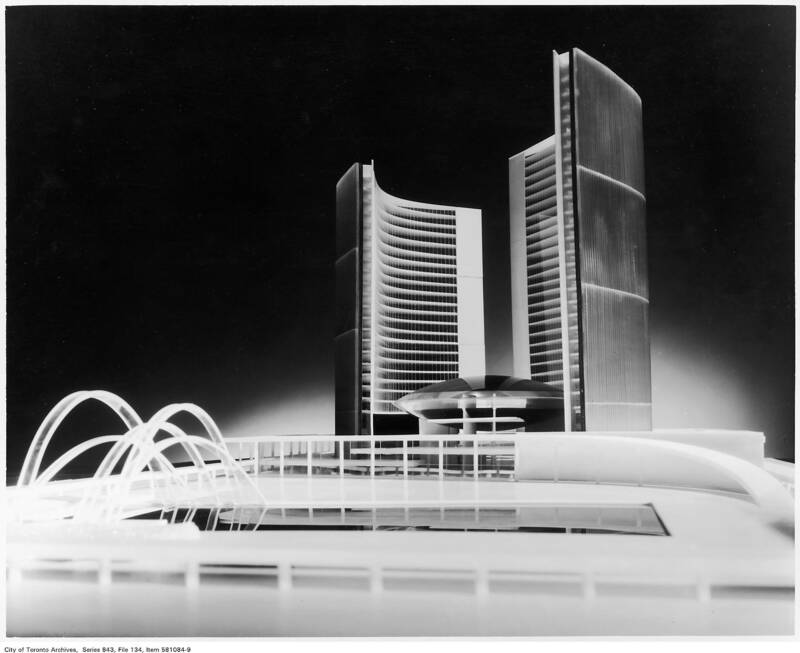 However their proposal failed to win the hearts of Toronto voters, who refused to approve the funding for the $18 million building. 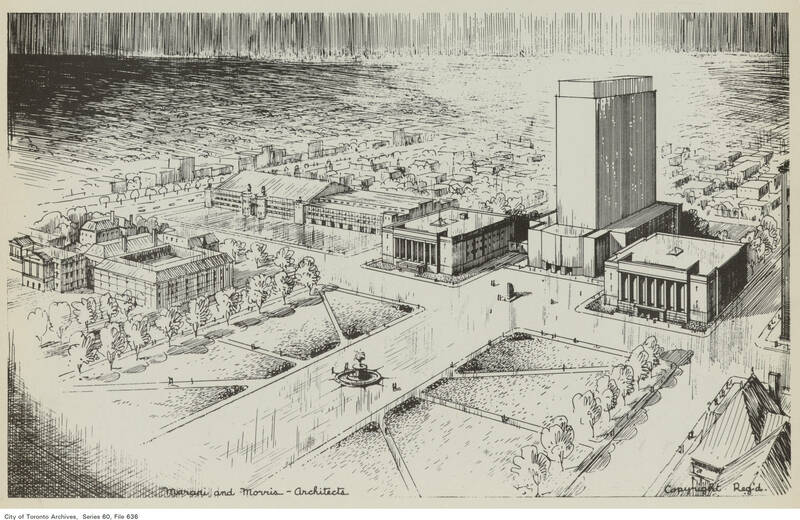 This rejection paved the way for Council’s approval of an international architectural competition to choose a new city hall design. By the submission deadline, there were 520 entries from 42 countries. The design by Finnish architect Viljo Revell was the winner. 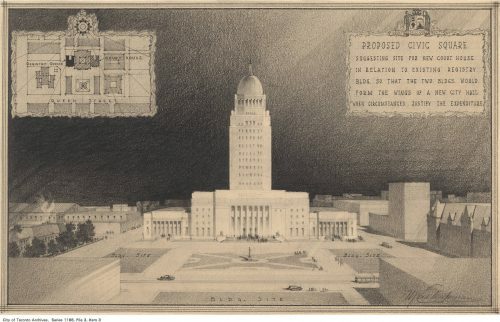 For more information on the background of the construction of New City Hall, see our web exhibit, A Step Forward in Time. One element of Revell’s design that never came to fruition however, was the ‘Top of the Tower’ rooftop restaurant on the 27th floor. 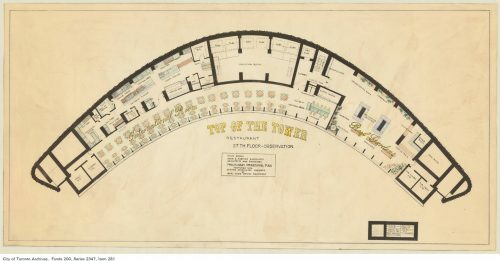 Although the restaurant never opened, the 27th floor did become a publicly accessible outdoor observation deck, until it was closed for accessibility and safety concerns.